It seems appropriate to launch a blog on my birthday. Hello, archinect, this is the guy maybe known by a couple people as "el Duderino" or "el_Dude." I've been around archinect for about three years, and I'm really excited to have this student blog. You can read the blurb on the 'about this blog' section to see what I've been up to, and where I've been before coming to Berkeley last fall. So let's get started. It's the weekend after the first (half)week of classes at Berkeley. This is my second year of two in the M.Arch II program; unlike the first year, I really feel as though I know what I'm doing (haha, let's see how long that lasts). It's great to be back after a summer working in San Francisco. I did do quite a bit of scholarly stuff over the summer, reading books relating to my thesis topic (more about that later) and writing a research paper. 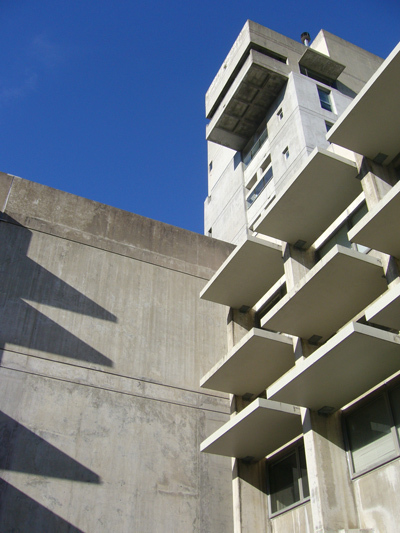 In addition to two architecture seminars, one on off-site fabrication and a theory class on globalization, I'm planning to take two classes outside Wurster Hall (pictured in all its beauty below). One is Sound Art, taught by a "sound artist", and another Modern Poetry, both upper-division undergrad courses. My hope is to learn how to listen and read closer, more critically, and more productively. 1. Get Berkeley out there. 'nuff said. 3. Talk about the architecture that's going on around the Bay Area. 4. Provide some kind of assessment of what kind of place Berkeley is to study architecture. 5. Test my thesis ideas on you all, and hopefully get some feedback. In the next post or two, I'm going to recap last year, showing some images of the projects I did and talking a little about the major events at the school. I really think Berkeley is a place undergoing a big transformation, if a bit slower than some might like. But it's a place that's truly made by the students, so as long as we continue to turn things up and rock the place, it's gonna be a good show. Stay tuned.